Fairmont le Chateau Frontenac, Quebec City.A week before what would have been my parents sixtieth wedding anniversary I found myself heading to Quebec City and the Fairmont le Chateau Frontenac, the very hotel my parents stayed in on their honeymoon. I believed, at the time, that this was strictly coincidental, for I had no desire to recreate the beginning of a failed marriage, but a part of me also strongly suspected that there was no such thing as pure coincidence. My father was straight off the farm – had never been anywhere or done anything – but he was a young man with the good looks of a B-movie star. My mother led a more sophisticated life as the daughter of a speechwriter for President Franklin Roosevelt during World War II. She had grown up in Washington, DC, which she believed was like being at the center of the universe, especially during the war. When my grandfather was sacked by Truman, he retired to his family home in Upstate New York, bringing along his wife and youngest daughter and four house cats. Even though my mother had just graduated from high school, when the school year rolled around she decided to take another senior year at the little rural school near her new home primarily because she didn’t know what else to do. That is how she happened to meet my father. Sixty years later as I stood in line in Montreal waiting for the train to Quebec City, I stared at the art deco bas relief covering the end wall of Central Station. Stylized stony figures doing the monumental things that needed to be done in order to create a civilization silently encouraged Canadians to take pride in whatever they were doing. My parents could have stared at this same wall, I thought, for the station was completed in 1943. As I looked at that hopeful frieze – and it was hopeful, for what is more forward-looking than a tribute to a country’s settlement and industrialization – I wondered if my parents saw that same hopefulness when they stared at the frieze. Because they were about to embark on their new life together, in some ways, they must have been filled with hope and plans for their shared future. Clickety-clack. Clickety-clack. The train headed out of the station. Past the red neon sign advertising Farine Five Roses. Through the compact city crammed onto an island. Past the geodesic dome from Expo 67. Over the bridge and through the suburbs and – clickety-clack – on our way toward Quebec City. In a senior class of forty-two, there was no place to hide. The boys thought my mother was cute. The girls thought she was stuck-up. My mother tried to win them all over by being disarmingly charming and it worked. She dated the most popular boy in the school and became lifelong friends with most of the girls. As the train neared Quebec City, I thought about an old white suitcase I had at home. It was the suitcase my mother used on her honeymoon and when I was little I used to like to open it up and reach into those coral-colored satin pockets that lined the inside of the bag and I’d wonder what my mother had put in those pockets. Honeymoon things, I supposed, only I didn’t know what that meant. My cab took me up the narrow winding streets from the train station in Quebec City to the Fairmont le Chateau Frontenac. It was St. Jean-Baptiste Day and La Fete nationale du Quebec and the cobblestone streets were sparkling with broken glass, evidence of a wild roving party that I kind of wish I hadn’t missed. Up, up, up we went past low-slung stone shops with colorful doors. Past little green parks with large, shady trees and couples sitting on benches soaking up the late June sun. Past a mime with a white face and rosebud mouth trying to drum up some interest as he rocked back and forth on a unicycle. The Fairmont le Chateau Frontenac stands over the city like a Renaissance sentinel with its steeply pitched green roof, towers, and massive stone construction. Built at the end of the 19th century by Canadian Pacific railroad magnate William Van Horne, the hotel was designed by the American architect Bruce Price, father of etiquette maven Emily Post. Over the past century the hotel has hosted several heads of state including King George VI and Queen Elizabeth, Chiang Kai Shek, Charles de Gaulle, Ronald Reagan, Francois Mitterrand, Winston Churchill, and Franklin D. Roosevelt. Movie stars have stayed there. As have numerous honeymooning couples – like my parents – who, for a few brief days in their lives, were encouraged to suspend disbelief and pretend they had money, power, and beauty. Today I suspect it’s easier to transcend class than it was in 1950. We can pull out credit cards and buy experiences without really having the means to pay for them whereas I know my parents were traveling on a shoestring. At that time my father was a hired man on a dairy farm and my mother worked as a typist in a farm bureau office. As I stepped off the cobblestone road and walked into the lobby of the Frontenac, I tried to imagine my parents approaching the reception desk – my mother clutching her small white suitcase in one hand and holding the arm of my farmboy father. I’m sure their deer-in-the-headlights look was the finishing touch as the doorman said Bonjour and I just hoped the clerk was nice to them as they nervously checked into the hotel. Early the next morning I headed out of the hotel past the statue of a jaunty looking Samuel de Champlain and walked down into Old Quebec. It was still early when I huffed and puffed my way back to the hotel so I decided to walk along the path overlooking the St. Lawrence River. The early morning sun had given way to a gray day and large dark clouds filled the sky making the river look cold and steely. Down along the waterfront I could see a small ship had pulled in to dock – it was flying a string of brightly colored flags like the kind you see at a used car lot. I reckoned it was the ferry that took people to the other side of the river. I climbed a small hill and found myself at the edge of a large expanse of green and realized I was at the edge of The Battlefields Park, site of numerous skirmishes and battles between the French and the English in the 18th century. Small gusts of wind pushed my hair into my face as I sat on a bench and watched a middle aged man walking a black terrier try to carry a cup of coffee in a ceramic mug without spilling it. I turned and looked toward the river and tried to imagine how surprised the French soldiers were in 1759 when, under the cover of darkness, British troops came up from the river having climbed the bluff to reach this spot just beyond the old city walls. The British victory at the ensuing battle on the Plains of Abraham effectively changed the course of history in North America and two hundred and fifty years later the French Canadians are still pissed. The wind was picking up and the dark clouds were now scudding across the sky as I walked down the grassy slope toward the Frontenac. The surface of the river looked rough and as I reached the boardwalk behind the hotel, I wondered if the boardwalk was there sixty years ago when my parents were visiting. Would they have been able to stroll beside the hotel and watch the powerful St. Lawrence as the river made its way inland from the Atlantic? My parents cut their honeymoon short, and I never knew why. Was it something he said or didn’t say? Was it their discomfort with being at a swanky hotel in what must have seemed like a very foreign land to the kids right off the farm? Did they run out of money? I’ll never know. Their honeymoon to this beautiful city was both the beginning, and the beginning of the end for them. Their marriage lasted for nineteen years. And their most lasting contribution as a couple was their four children. They weren’t overtly mean to each other but for the last decade they were together there was an overarching sadness to our lives. As kids we knew something bad was just below the horizon but couldn’t quite define what that might be until one day my father woke up, got into his truck and drove away, never to return. Finally it began to spit rain so I headed back into the grand hotel that served as both temporary sanctuary from my present and rabbit hole into my past. 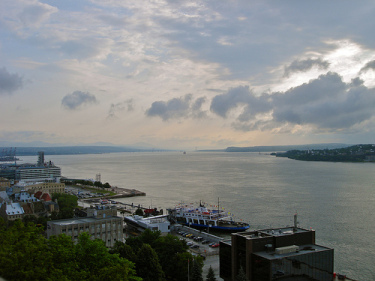 As I lay on my comfortable bed in my lovely room and idly looked through a rain-spattered window at the St. Lawrence River as it snaked through the low-slung hills of Quebec, scenes from my childhood ran through my head like an old home movie, only in my movie the family wasn’t smiling. I thought of 19th century essayist George Santayana’s dictum – those who cannot remember the past are condemned to repeat it. And with a determination not unlike that of the people who lived in this city that spilled down the hills from the Plains of Abraham and The Battlefield Parks – a city with its own failed past marriage – I decided I was not going to let the past ruin my future.